Based on personal experience and extensive conversations with leaders and investors in SaaS companies, subscription customers tend to fall on a distribution curve with respect to their relative happiness/success and their revenue potential. A large group of customers are in an area where they may not represent an immediate incremental revenue opportunity; however, at either end of the distribution curve lie customers that need particular attention and focus because they have the opportunity to impact revenue either positively or negatively. 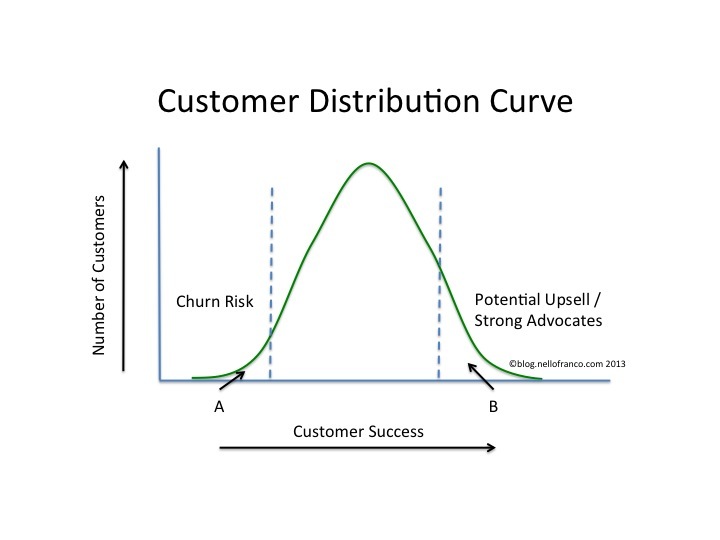 At one end (Area “A” on the curve above) are customers who represent a churn risk and will negatively impact your revenue if their issues are not addressed. In a SaaS world, it is important that you understand who these customers are, why they’re at risk of churn, and what you can do about it as quickly as possible. The earlier these customers are identified, the sooner your organization can take action to 1) address their specific needs; and 2) understand and address the root cause of the issue and proactively address it for the rest of your customer base. 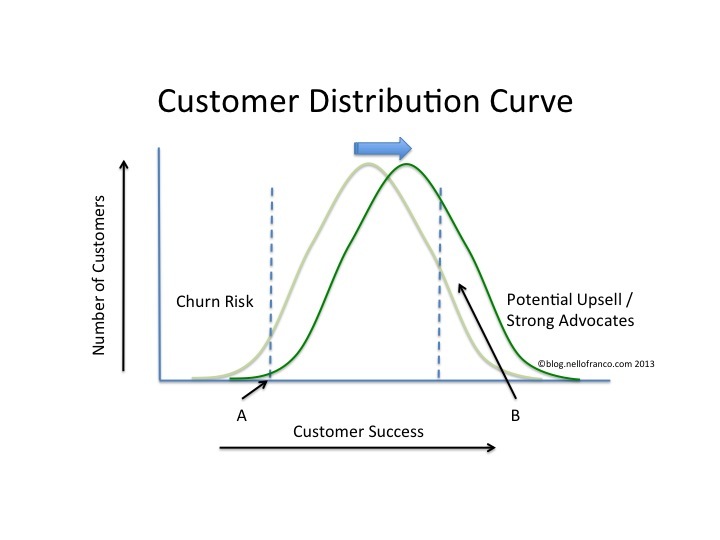 At the other end of the curve (Area “B”) are customers who either 1) represent a direct upsell opportunity; or 2) can become influencers or advocates to help you land and convert new customers. Engaging appropriately with these customers and potentially introducing them to other parts of your organization (sales, services, marketing) should happen in as timely a manner as possible in order to ride the momentum of their current experience. Identifying customers at either tail of the curve and working closely with them to optimize revenue is hard to do well by “feel”, especially at scale. With a small number of high value customers and multiple relationship touch points, you can keep a fairly tight pulse on their health; however it is extremely difficult to get any kind of early warning signals or early success indicators without some degree of automation or Customer Intelligence solution that uses data and analytics to identify these characteristics. A number of technologies are emerging in the Customer Success Automation / Customer Intelligence / Recurring Revenue Optimization space. In fact there are almost as many names for this emerging space as there are companies in it, and those companies’ websites all contain great information on their philosophy and differentiators. Gainsight, Totango, and Scout Analytics all focus on identifying customers at the tails of the curve using your internal data (from your SaaS solution and/or your CRM data) while companies like InsideView help you understand external factors at your customers’ organizations (M&A, announcements, key personnel changes, and other activity) that can impact their need/want for and perceived value in your product. Companies continue to emerge in this space and some analytics-based companies, such as KissMetrics, are providing Customer Success stories of how SaaS companies are using web/behavior data to optimize subscription revenue and reduce churn. Now, what you do with this information is up to you, and while the short-term reactive course of action is to take appropriate steps with the customers identified as the ones in the tails of the curve; the long-term, proactive course of action is to use this actionable data to drive the experience, management and behavior of your entire customer base so that you shift the entire bell curve to the right. This leads to a significantly smaller distribution of “At Risk” customers in Area A and the larger distribution of successful customers in Area B. One key way to move the entire curve is to take appropriate actions based on customer behavior data. A timely, recent HBR blog post entitled: CMOs: Build Digital Relationships or Die urges CMOs to take advantage of the customer data that is available to them and build an ongoing, digital relationship with those customers. I also cover the need to build that marketing relationship in a recent blog post. Please share your thoughts, opinions, and experiences regarding this model and the birth/evolution of this space. Hi Nello, I totally agree with the switch to becoming more proactive, but I think it should be one step further: being pro-customer, which encompasses these three values: pro-active, pro-value, pro-fessional. The more Pro-Customer a company becomes, the more involved they are with customer data. Meaning: they aren’t just looking for data trends to explain behaviors, but they are using it to predict behaviors! This knowledge will guide their product development and marketing strategies…and this is what will drive these companies to build/provide the service that will generate upsell and renewal opportunities. Ellis, great point. This is the type of activity that moves the entire curve to the right. Thanks for contributing. Along the lines of Ellis’ comments, there are new ways to identify who those advocates are and to become more “pro-customer”. Part of it is based on data as the data will tell you who is best utilizing your product but you still need to focus on identifying who your real supporters are and then mobilizing and motivating these advocates. You would be surprised at what your advocates can do by just asking them and then recognizing them for their efforts. Newer technology like Influitive helps B2B companies harness this power.